The CRKT 2630 Du Hoc Karambit Knife was designed by Austin McGlaun (in collaboration with Ryan Johnson of RMJ Tactical) in honor of his late uncle, as part of the Forged by War program. The Du Hoc is a powerful tactical knife that features a 5.095 inch beefy recurve blade made of SK5 carbon steel, .202 inches thick, with a sharpened front edge, a compound grind and a non reflective black powder coat for corrosion resistance. The Du Hoc has full tang construction for strength, textured and grooved black G10 scales and an extended ring pommel for superior grip in the most dire situations. 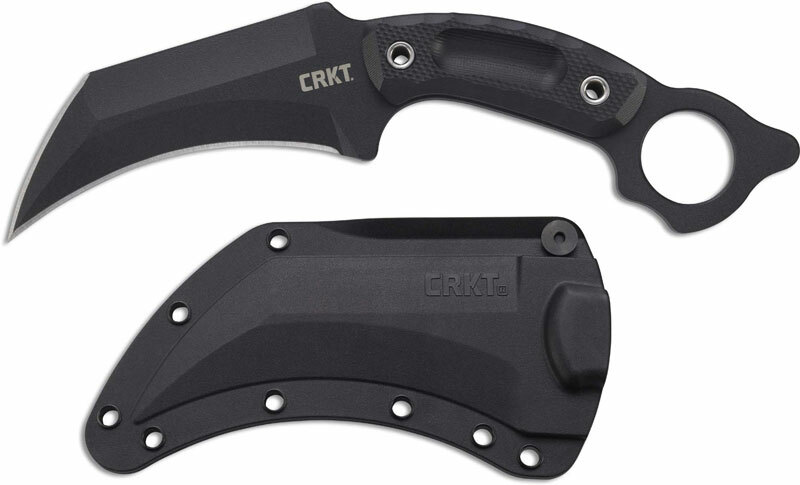 A black GRN (glass reinforced nylon) sheath is included. The Du Hoc Karambit has an overall length of 9.625 inches, and it weighs 9.3 ounces. As part of the Forged By War program, a portion of the CRKT net profits from the Du Hoc will be donated to Austin McGlaun's charity of choice - Purple Heart Homes.